~ A Captain Atom blog. On December 22, 2015, my friend Roy and I debuted our podcast, Silver & Gold. The podcast is a review show covering the DC Comics characters Booster Gold and Captain Atom. We plan to cover each issue of Booster Gold (vol 1), which ran for 25 issues from 1986 to 1988, each issue of Captain Atom (vol 1, DC), which ran for 57 issues from 1987 to 1991 and included two annuals. It is our goal to also cover Booster and Cap’s followup series as well as their various appearances in other DC Comics books. Below are the episodes recorded and released so far with the most recent episode listed first. The wait is over. In this episode, Roy and Jay review “Blowback” from The Fall and Rise of Captain Atom (vol 1) #1 by Cary Bates, Greg Weisman, Will Conrad, Ivan Nunes, Saida Temofonte, Jason Badower, Kristy Quinn, Gabriel Hardman, Jordan Boyd, and Jim Chadwick. The New 52 Captain Atom can’t live with guilt and does something drastic. We also review “The Tomorrow Run” from Booster Gold (v0l 1) #13 by Dan Jurgens, Gary Martin, Gene D’Angelo, Bob Lappan, and Barbara Randall. Sick with a future bug, Booster enlists the help of Rip Hunter and Goldstar to travel back to the future for a cure. No Silver/Gold Watch this episode. Click here to play episode 24! It is again time to join FKAjason and Roy “Charlemagne” Cleary as they review and discuss Booster Gold (vol 1) #12 and Captain Atom (DC vol 1) #12. Booster has his final showdown with the Director of the 1,000. Captain Atom is reunited with his son Randy. “War” from Booster Gold #12 was by Dan Jurgens, Mike DeCarlo, Gene D’Angelo, John Costanza, and Barbara Randall. It’s Booster versus the SCUBA Squad and the 1,000. “Sweet Dreams, Major Force” from Captain Atom #12 was by Cary Bates, Greg Weisman, Pat Broderick, Bob Smith, Nansi Hoolahan, Duncan Andrews, and Dennis O’Neil. Captain Atom is finally reunited with his son Randy while Eiling and Megala prepare for the coming of the mysterious Major Force. Silver Watch: The month Captain Atom #12 came out, Cap also appeared in Firestorm: The Nuclear Man #68, Justice League International (vol 1) #10, Millennium #5, Wonder Woman #13, Millennium #6, Superman #14, Millennium #7, and Millennium #8. Click here to play episode 23! Join FKAjason, Roy “Charlemagne” Cleary, and The Fire and Water Network’s Irredeemable Shag as they review and discuss Booster Gold (vol 1) #11 and Captain Atom (DC vol 1) #11. Shag was asked to guest on this episode because he is an expert in the 1987 DC crossover/mini-series event Millennium. Also, Firestorm, the Nuclear Man is in this issue of Captain Atom. “When Glass Houses Shatter” from Booster Gold #11 was by Dan Jurgens Mike DeCarlo, Gene D’Angelo, John Costanza, Barbara Randall, and Gerry Conway. Booster’s battle with the 1,000 continues as they enlist the aid of Blue Devil baddie Shockwave. 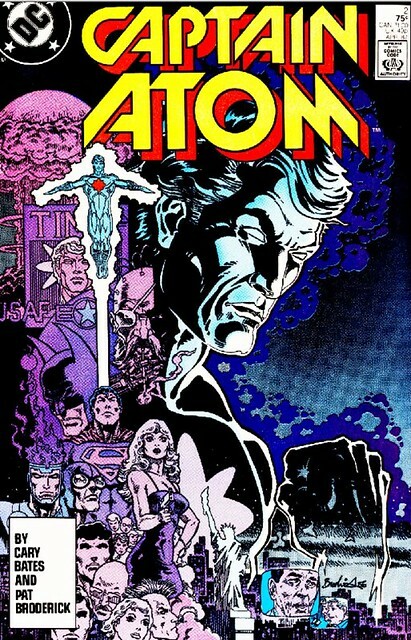 “A Matter of Choice” from Captain Atom #11 was by Cary Bates, Greg Weisman, Pat Broderick, Bob Smith, Nansi Hoolahan, Duncan Andrews, Dennis O’Neil, and Jerry Bingham. Captain Atom is sent into the swamp to take down Manhunter pawn Firestorm. Silver Watch: The month Captain Atom #11 came out, Cap also apeared in Action Comics #596, Blue Beetle #20, Justice League International #9, Millennium #1, Millennium #3, Millennium #4, Secret Origins #22, Suicide Squad #9, and Teen Titans Spotlight #18. Click here to play episode 22! Vance’s Throwback Thursday returns with him and guest-host FKAjason reviewing “One Second of War” from Space Adventures #38 (Charlton Comics, 1961) by Joe Gill and Steve Ditko. It is our first mini episode with big freaking news from DC Comics! What will it mean for Captain Atom? What will it mean for Silver & Gold? What will it mean for the world as we know it? It’s 10/10 so FKAjason and Roy “Charlemagne” Cleary are ready to talk about some old “number 10” comics! 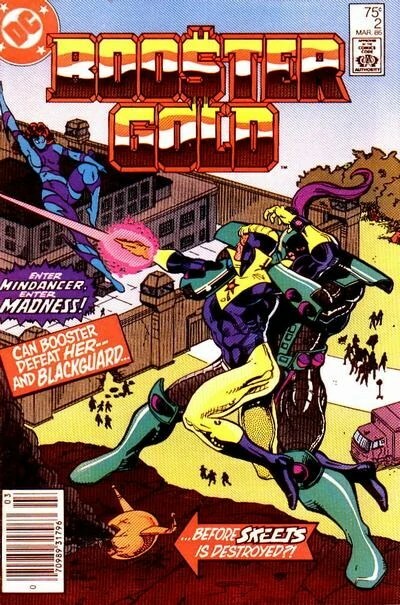 First we revisit Booster Gold (vol 1) #9 with Herb Fung! Then join us for “Death Grip of the 1,000” by Dan Jurgens, Mike DeCarlo, Gene D’Angelo, Augustin Mas, Barbara Randall, and Alan Gold from Booster Gold (vol 1) #10. Hang around after that for “Wish You Were Here” by Cary Bates, Greg Weisman, Pat Broderick, Bob Smith, Carl Gafford, Duncan Andrews, and Denny O’Neil from Captain Atom (DC, vol 1) #10. Guest Stars: Senator Ballard, Director of the 1000, killer robots, Captain Atom’s supporting cast. Throwback Thursday returns with Vance in the driver’s seat as he and FKAjason review “A Victory for Venus” from Space Adventures #37 (Charlton Comics, 1960) by Joe Gill and Steve Ditko. The ninth day of the ninth month can only mean that FKAjason and Roy “Charlemagne” Cleary are ready to talk about some old “number 9” comic books! Join us for “Time Bridge Part II” by Dan Jurgens, Mike DeCarlo, Gene D’Angelo, John Costanza, and Alan Gold from Booster Gold (vol 1) #9. Then stick around as we pick at “Blood and Betrayal” by Cary Bates, Pat Broderick, Bob Smith, Carl Gafford, Duncan Andrews, and Denny O’Neil from Captain Atom (DC, vol 1) #9. Guest Stars: Brainiac 5, Chameleon Boy, Ultra Boy, Senator Ballard, Director of the 1000, Bolt, Chiller, and Ronald Reagan. Silver & Gold Watch: A quick reminder in the pages of Firestorm: The Nuclear Man (vol 1) #64 of how Captain Atom trounced the “nuclear man,” and both Booster and Cap appear in the pages of Who’s Who Update ’87 #3. In this Throwback Thursday episode of Silver and Gold, Vance is back with FKAjason to talk about “The Space Prowlers” from Space Adventures #37 (Charlton Comics, 1960) by Joe Gill and Steve Ditko. 08/08/2016 – 16: LIVE OR LET DIE? In this episode of SNGPOD, Roy and Jay review Time Bridge (Part I of II) from Booster Gold (vol 1) #8 by Dan Jurgens, Mike DeCarlo, Gene D’Angelo, Augustin Mas, and Alan Gold. We also review Live or Let Die? from Captain Atom (vol 1, DC) #8 by Cary Bates, Pat Broderick, Bob Smith, Carl Gafford, Duncan Andrews, and Dennis O’Neil. Silver Watch: Captain Atom vs Firestorm (again). In this Throwback Thursday episode of Silver and Gold, Vance is back with FKAjason to talk about “Captain Atom on Planet X” from Space Adventures #36(Charlton Comics, 1960) by Joe Gill and Steve Ditko. 07/07/2016 – 14: THE MAN OF GOLD VS THE MAN OF STEEL! Superman teaches Booster Gold a harsh lesson with his fists in Booster Gold(vol 1) #7 by Dan Jurgens, Mike DeCarlo, Gene D’Angelo, Augustin Mas, and Alan Gold. Captain Atom gets sucker-stabbed by the Cambodian while he’s chatting up Plastique in Captain Atom (DC, vol 1) #7 by Cary Bates, Pat Broderick, Bob Smith, Carl Gafford, Duncan Andrews, and Dennis O’Neil. And Roy and Jay are there to talk about it! In this throwback Thursday episode, we reach back just four years to our first podcast. FKAjason, Roy “Charlemagne” Cleary – along with guests Marcus Cleary and Rebecca Ledford – list our top five superheroes. Updated with additional commentary by FKAjason. Listen to us list and discuss our fifteen favorite super-heroes. Like Julius Caesar in 49 BC, FKAjason and Roy “Charlemagne” Cleary cross the Rubicon with Booster Gold, Skeets, Superman, and their new pal Z. Finally, the origin of Booster Gold is revealed by Dan Jurgens, Mike DeCarlo, Nansi Hoolahan, Augustin Mas, and Alan Gold. We then turn our sights on the new Doctor Spectro trying to get a piece of Captain Atom’s lie with Cary Bates, Pat Broderick, Bob Smith, Carl Gafford, Duncan Andrews, and Dennis O’Neil. All of this and more are found in today’s reviews of Booster Gold (vol 1) #6, and Captain Atom (DC, vol 1) #6. Plus, your listener feedback! This Throwback Thursday, Vance and Jay discuss “The Wreck of X-44” from Space Adventures #36 by Joe Gill and Steve Ditko. We also touch on DC Universe: Rebirth and the possibility that Captain Atom might be God. In this episode of Silver and Gold Podcast, Captain Atom faces off with Firestorm, the Nuclear Man! Dr. Spectro faces off with a journalist! Booster Gold faces off with a killer zamboni and the Metropolis hockey team! So many face offs we had to call in the Irredeemable Shag to help us out. We review the Booster Gold (vol 1) #5 story “Face Off” (by the creative team of Dan Jurgens, Mike DeCarlo, Nansi Hoolahan, Augustin Mas, and Janice Race) and the Captain Atom (DC, vol 1) #5 story “The Return of Dr. Spectro” (by the creative team of Cary Bates, Pat Broderick, Bob Smith, Bob Le Rose, Augustin Mas, and Dennis O’Neill). 04/04/2016 – 07: MISSING IN ACTION! This time out, Jay and Roy review Booster Gold (vol 1) #4 by Dan Jurgens, Mike DeCarlo, Nansi Hoolahan, and Augustin Mas. Thorn, Booster, and Skeets battle Mindancer, Blackgaurd, and the 1,000. 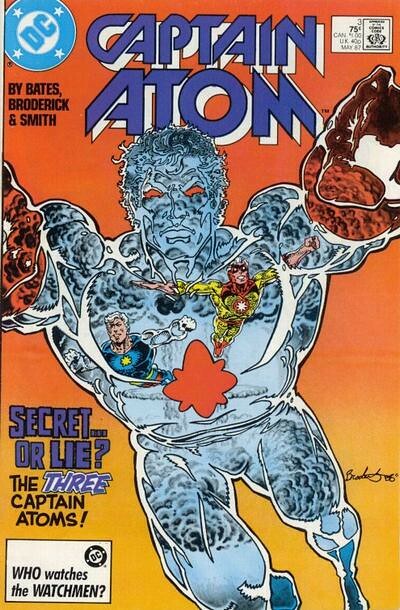 Then we review Captain Atom (DC, vol 1) #4 by Cary Bates, Pat Broderick, Bob Smith, Carl Gafford, and Augustin Mas. Nathaniel Adam is finally reunited with his daughter after his 18-year-absence. Plus, scads of your listener feedback! 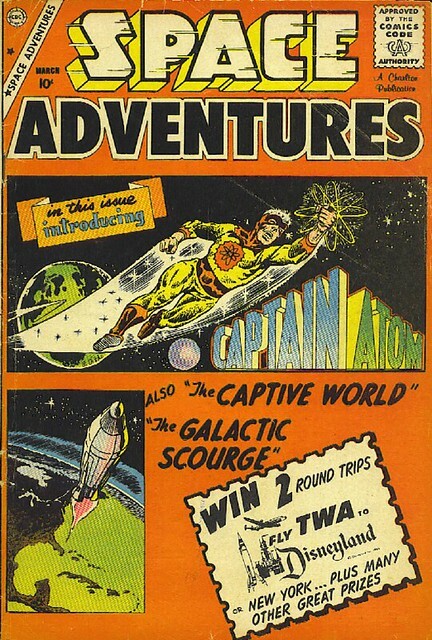 Throwback Thursday returns and this time out, FKAjason and Vance review the Space Adventures #34 Captain Atom story “The Second Man in Space” (written by Joe Gill with artwork by Steve Ditko). We discuss the laziness of “space vaccines” and the general cheesyness of silver age comics. Vance can barely stay awake for this one, so you know you’re in for a real treat! 03/02/2016 – 05: FIGHTING MAD! 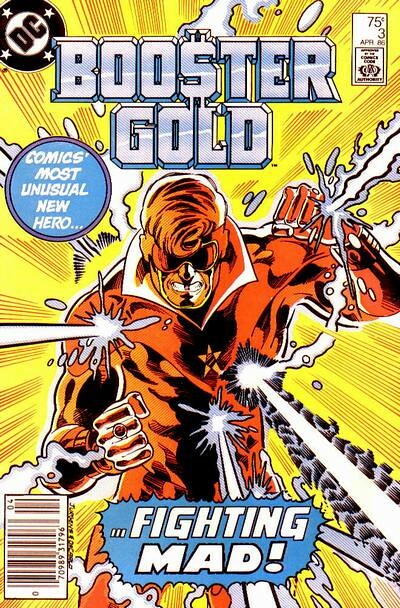 In episode 05 of the Silver & Gold Podcast, we discuss Booster Gold (Vol 1) #3, The Night Has Two-Thousand Eyes (by Dan Jurgens, Mike DeCarlo, Nansi Hoolahan, and Augustin Mas), and Captain Atom (DC Vol 1) #3, Blast from the Past (by Cary Bates, Pat Broderick, Bob Smith, Carl Gafford, and John Costanza). Also, FKAjason and Charlemagne’s secret origins are revealed, that’s what friends are for, Booster in peril, Thorn’s fashion choices, The Love Boat, Booster Gold looks like an idiot, typical Eddie, a wall of balls, Mindancer’s brain bolt, Firestorm as the star of the book, Captain Atom’s creepy meeting with his daughter, and Nate going critical.. Wait, haven’t we already introduced Captain Atom? Well, yes and no. Call this episode of SNGPOD our “throwback Thursday” episode. We have a special guest on and we talk about the origin of the “original” Silver Age Captain Atom from Space Adventures #33. The story (written by Joe Gill with art by the legendary Steve Ditko) is titled “Introducing Captain Atom,” and it, well, introduces Captain Atom. 01/28/2016 – 03: CAPTAIN ATOM… A TRUE AMERICAN HERO? In this episode of Silver & Gold, we discuss what I like to call “Captain Atom versus the French Canadian Separatists.” After a brief discussion about Captain Atom’s junk, we review Captain Atom (vol 1, DC) #2 by Cary Bates, Pat Broderick, Bob Smith, Carl Gafford, and John Costanza. 01/12/2016 – 02: ENTER MINDANCER, ENTER MADNESS! After some brief Force Awakens spoilers and a correction to last episode (followed by more Star Wars talk), we review Booster Gold (volume 1) #02 by Dan Jurgens, Mike DeCarlo, Tom Ziuko, and Augustin Mas. We also cover a little Knight Rider, 80s comic smells, and listener feedback. 12/22/2015 – 01: FIRST ISSUE EXCITEMENT! 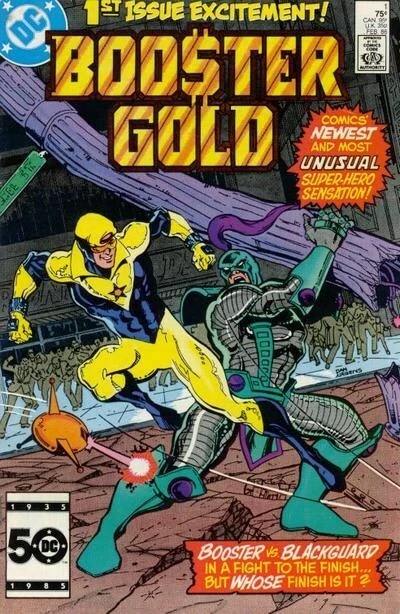 In the first episode of the Silver and Gold Podcast, we and review Booster Gold (vol 1) #1 (from February 1986 and written and drawn by Dan Jurgens with inks by Mike DeCarlo, colors by Tom Ziuko and letters by Augustin Mas) and Captain Atom (vol 1, DC) #1 (from March 1987 and written by Cary Bates with pencils by Pat Broderick, inks by Bob Smith, colors by Carl Gafford, and letters by John Costanza). This podcast was inspired by Shag and Rob of The Fire and Water Podcast. This is the only episode of this podcast with beeped-out swear words.